← Get a September Roundup of GDPR Mishaps and Find out How You Can Help Your Own Business! After spending 20 years in the industry working with business applications, and the last 10 years helping organisations implement CRM platforms and solutions, there have been many changes, but the fundamental need for CRM has not significantly changed in the last two decades. The available technology seems to move in spurts and then leaps and bounds, but for most privately owned businesses a lot of the innovation is misplaced. Here at MyCRM we are pleased to announce the release of MyCRM Essentials; a pre-configured, straightforward, no-nonsense approach to online managed service, Customer Relationship Management (CRM), delivering outstanding value and a low cost of ownership for micro, small and mid-sized business. MyCRM Essentials is offered with zero cost of deployment, as set up services are included as part of the ongoing fully UK hosted subscription service. Underpinned by Microsoft’s tried and tested Microsoft CRM application, MyCRM Essentials combines this proven CRM capability with a number of MyCRM’s enhancement products, to provide customers with a true ‘out of the box’ solution, that works immediately to support their business needs and growth goals. Given the prolific number of CRM applications in the marketplace, including Microsoft Dynamics 365, Salesforce, Sugar, Zoho and an array of others, We thought it would be useful, and wanted to answer the common question of why MyCRM Essentials? The simple truth is that for micro and small businesses, those that employ the typical 3 to 30 people, seem to struggle in comprehending or budgeting for what’s being offered by the large vendors, and what is apparent is that these same vendors are gearing more and more towards larger enterprise organisations. As interesting as Business Intelligence (BI), Artificial Intelligence (AI), Machine Learning and Social Sentiment impact analysis, is, it’s likely to be much less appealing to anyone operating in the small business arena. Does a Sales Manager, Marketing Manager or MD of a small company really need to rely on a super clever machine and systems intelligence to tell them how well they are engaged with their customers, and what deals are going to close or risk being lost? No, the truth is they don’t, they just need a simple way to manage the engagement and interaction with their customers and something to help encourage sales, helping evolve their businesses in meeting targets and growing. Along with the range of this modern system complexity being offered by the major vendors in a variety of guises, one thing is becoming very evident. That is, that they all appear to be ever increasingly moving away from what the essence of what CRM is all about and missing the essential requirements of business. What should be straightforward is now not so, with an array of things being offered that extends CRM beyond the foundations of customer engagement and customer service, on to new heights of analysis with BI and AI becoming the next new wave of technology, or what many believe is the next big thing! The other very important factor that is seemingly being ignored (not by MyCRM) is cost, with ownership and cost of entry to join in with this new wave of technology, becoming well beyond that which many micro and small businesses can afford. Even many mid-sized businesses are becoming prone to bowing out of making investment decisions in CRM as the cost seems to ever escalate. For many businesses who understand and who want to invest in cloud applications, being asked to pay £80+ per month per user is just too much for CRM. What is even more apparent is that many small businesses face even greater costs once they want to participate in email marketing to prospects and customers, when they want to understand which recipients open their email and click on content etc. These are the prospects that are identified as those they should pursue for potential sale as a high priority. For CRM users who want to do this, this is where the cost point per month can really start to run away. So in answer to the original question why MyCRM Essentials? The answer is because MyCRM Essentials delivers classic CRM functionality, improved with enhancements to make it more effective, easier to use, and which offers email marketing as part of the solution for only £58 per user per month on a rolling 30- day subscription. There is no long term lock-in contracts, and we start from just 2 users. Furthermore, MyCRM Essentials includes system setup and initial data migration services as part of the overall monthly subscription. So, there is no upfront consultancy costs, or army of consultants needed to take customers into the world of CRM ownership. 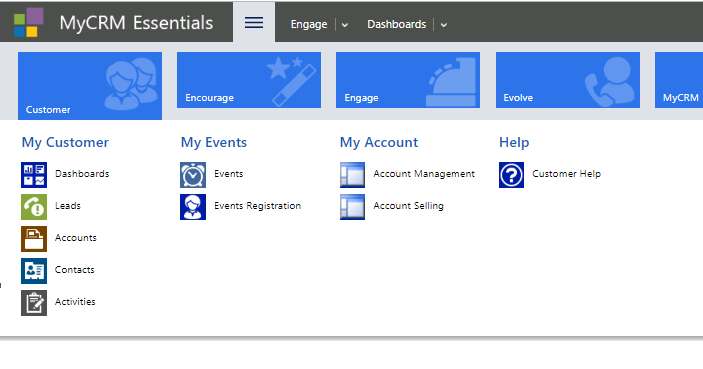 MyCRM Essentials is configured to work in line with how customers work. From delivering Marketing campaigns and Lead generation, through a managed Opportunity process through to the end sale, and beyond into Customer Services and dealing with Cases, MyCRM Essentials provides every function to support businesses who sell products and services and who need to support their customers. MyCRM Essentials provides true and effective Customer Relationship Management, essential to help smaller businesses grow and that offers a cost point which is affordable and which delivers outstanding value. This area holds entity records for Leads, Accounts, Contacts and Activities relating to these record types. Customer entity records are always evident through the MyCRM Essentials navigation tiles. Encourage is where it all begins, providing marketing capabilities and the enhanced ability to deliver email marketing campaigns which can be analysed to assess open rates and click-throughs. Encourage generates Leads and also manages product/services and sales collateral. Fig 1.3 above shows Marketing and Collateral entities with common Customer entities available. 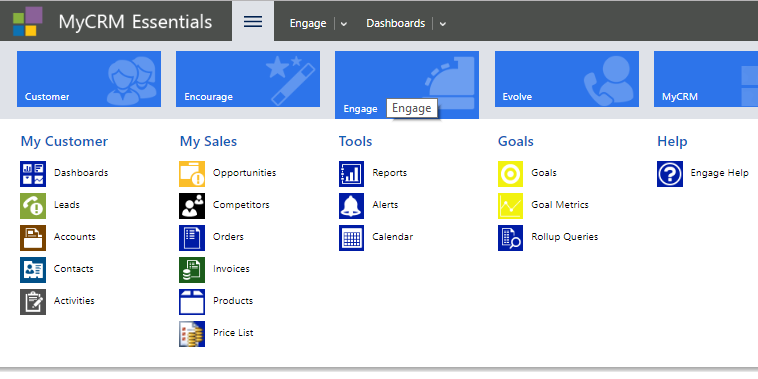 So Engage is all about selling, it provides access to Opportunities, Competitor information, Orders, Invoicing, Product and Price lists as well as Goals and Goal Metrics and a number of Sales Reports, including sales pipeline and activity engagement. Fig 1.4 above shows Opportunity and all things relative to the Sale. Evolve is the area responsible for Customer Service and the evolution of the customer. Dealing with Case Management and Customer Services delivery making use of standard service scheduling capability, Evolve ensures customer service is effective and customers remain customers. Fig.1.5 above shows Customer Service and the relevant entities relating to the ongoing support and development of a customer. MyCRM Essentials features record types which are pre-configured to support business activities without the need for any major additional configuration. Seen below (fig 1.6) is an Opportunity record which captures key information and allows the Opportunity to process through a series of define qualification and closing stages. These processes are fully configurable to include customer specific processes, fields with information capture. Fig 1.6 Standard Opportunity Form showing Business Process Flow. So this is what we think is essential to your business, no gimmicks, no consulting led engagements, just Essential CRM delivered. Why would we do this you may ask, well you only need to do a little bit of research into how an economy is structured and we take the UK as an example, but there are 5.4 million micro and small businesses in the UK, out of 5.7 million registered businesses. That is right, the other 300,000 organisations make up the medium and enterprise sector with only 7000 enterprise organisations being registered in the UK. So while the partners of the top providers chase a smallest slice of the pie, we are here to help those that need a straight forward, easy to use solution based on common sense and easy to deploy technology. MyCRM Essentials, helping your business take the next step.